The iconic floral fragrance in a travel size set. Because travel is a luxury, Flowerbomb is redesigned as an elegant and smart twist & spray. The iconic Flowerbomb fragrance, which breaks free from olfactory boundaries with its explosive floral signature now breaks from routine to hit the road. 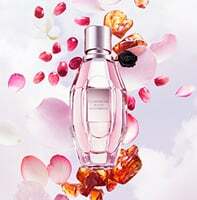 Just twist & spray, by turning the Viktor&Rolf sealed-top, the spray pops up. To travel lightly, and travel mindfully, each Flowerbomb on the go set unites three 0.6oz refill vials to slot inside its exclusive nomadic design. How do you replace the bottle in the twister? It does not continue to twist upward, it won't pop off, the bottle inside won't slide out nor can you even grip it, and I don't want to break the twisting mechanism. Twist it open like you are going to spray it, Gently pull the silver sprayer head directly upward to remove the vial from the plastic shell. Gently wiggle off the sprayer head then pop it on the new vile. &nbsp;Replace the vial back in the shell. Can I purchase replacement vials?